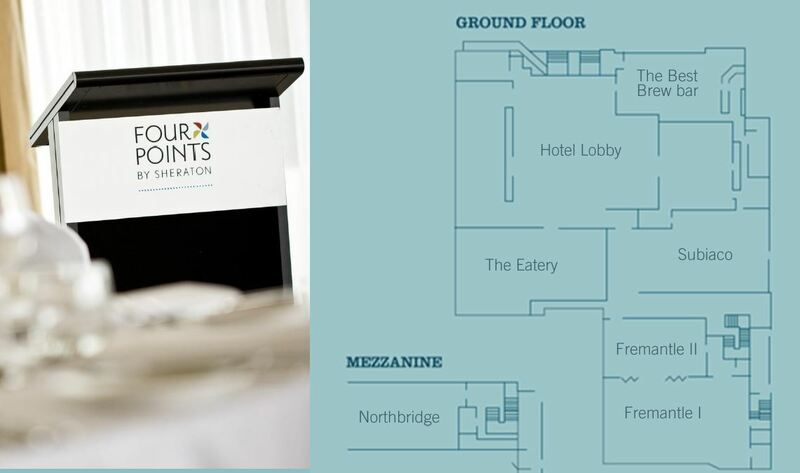 With 278 guest rooms and 4 flexible meeting spaces, Four Points offers an ideal location for business and leisure travellers alike. Conveniently located at the west end of the CBD, opposite RAC Arena and minutes from the city’s local attractions and financial centre. Enjoy breakfast at The Eatery restaurant and all day dining at The Best Brew Bar & Kitchen complete with an alfresco sundeck. Dining Facilities: The Best Brew Bar & Kitchen, a quirky venue ideally located opposite the Perth Arena offering a tasty menu showcasing local ingredients to create your favourite comfort foods. Kick back on the sun deck with a wide selection of local and international beers and delicious cocktails in a vibrant street art setting. The ideal place to unwind after a long day or kick start your night out. Description Inspire the best from your team in our stylish event space. With excellent service, we ensure a productive meeting whether big or small - our 422 square metres of flexible meeting space can easily accommodate up to 130 people banquet style. Our space includes a 230 square metre ballroom with large crystal chandeliers plus two meeting and function rooms, all equipped with Wi-Fi. We also offer a full business centre, the latest audio/video equipment and a wide range of catering services. You’ll find our hotel in one of the best spots in town. We’re just minutes from the city’s downtown and financial centre as well as many world-class corporations and businesses. Plus, a short walk takes you to the Perth Convention and Exhibition Centre. We’re also conveniently located near major freeways and within 30 minutes drive to the Perth Airports.